View Poll Results: do you think that only people with scores 240+ post their scores on the forums? after reading this forums for a while i've seen that many of the people who post their scores usually have very amazing scores. this does not follow normal data distribution so i just wanted to hear everyonws opinion on this. Yes i dont think its any coincidence that most people that take the time to write a long "my experience" post have high scores. i dont want to be disrespectful but where did you get that info from? 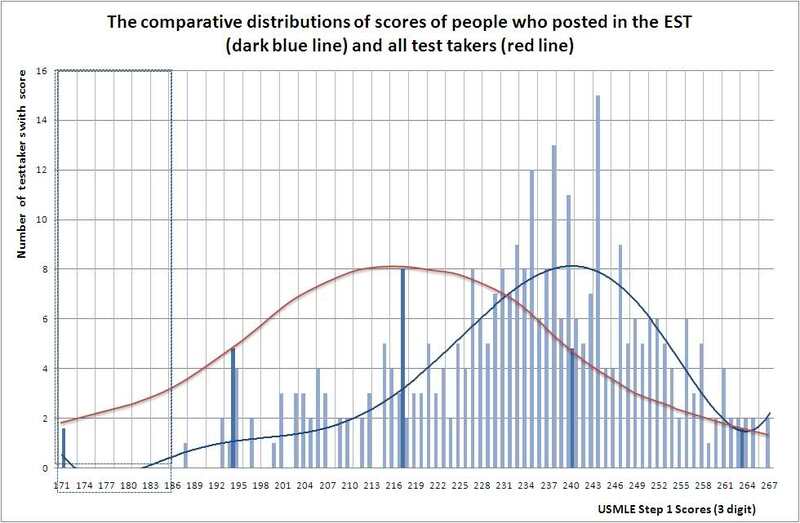 It says that the blue line represents the people who posted on the EST. What's the EST? A forum? If that is the case it would show the negative skew only for people who post (not all test takers) which is basically what orthoguy asks. On more thing: The question that would probably make more sense would be a poll where people can vote their scores anonymously, this could probably lead to a more realistic representation of the curve. i agree with You Pneux but it will still have the problem that many people do not read the forum, others read it but dont post and others may choose to write something different than the truth. Yes, that's why I thought that one could get at least a somewhat represantation that is closer to reality by letting people submit their scores in an anonymous way. im new to posting and just today learned how to do it. but id be happy to contribute if someone creates the thread. I Mentioned this in an old thread i started, not feeling alone anymore!!!! There are not only 240s stories.... There are 260s and once i saw 270 on a story!!! Thats why i started to doubt whether they were true without them posting their actual score report. Anyways those posts make you think that this test is easy!!! Very far from reality. High score bias is the answer.